A COMMUNITY meeting and conference room at the former Loughborough Magistrates’ Court will be officially renamed in memory of Mike Preston, the former council leader who died of cancer last year. Mike Preston, 67, of Broome Lane, Ratcliffe-on-the-Wreake, served on the borough council for 11 years, transforming the local authority over the short time he was leader. Stuck with a limited budget and Government cuts, Mr Preston managed to secure a waste, benefit and revenue contract that aims to save the council £4.2m. He also fought for the delivery of the Eastern Gateway Project – even declaring to cough up the missing £1m if the Government did not honour its promise and provide funding. He also wanted to save the old court house, in Woodgate, from developers and set about transforming it into a council chamber and home to such organisations as the Citizens Advice Bureau and Glebe House. Last year, he was diagnosed with cancer of the face, and underwent an 18-hour operation. He died at LOROS on the afternoon of Thursday, August 19. A community meeting room has been renamed in honour of a council leader who died last year. 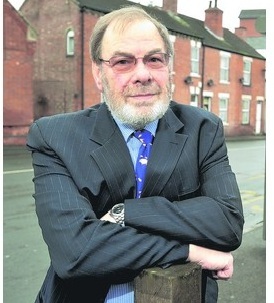 Former Charnwood Borough Council leader Mike Preston died in August after a short battle with cancer. His widow, Beryl, has unveiled a name plaque at the main meeting room at Woodgate Chambers, the old Loughborough Magistrates' Court building, which will now be called the Preston Room. Charnwood Borough Council consulted with councillors from across the political spectrum and there was unanimous support for the proposal. Mrs Preston said: "I think it is a lovely tribute to Mike. He would have been happy with it. It's lovely to know his political life meant something to so many people." Councillor David Slater, the council's current leader, said: "Mike was committed to making use of this significant building in the centre of Loughborough for use by the voluntary and community sector and the council. "He also wanted to retain many of the aspects of this room, which made it appropriate to use as a meeting room." Coun Preston was Conservative councillor for Queniborough between May 1999 and May 2011, serving as leader of the borough council from May 2009 to May 2011.